The British Library manuscripts blog has produced a rather marvellous article by Matthew Nicholls on Ancient Libraries. But what made it special to me was an image of an item which I had never seen before. As we all know, ancient books were written on rolls of papyrus. The modern book form or “codex” belongs to late antiquity. 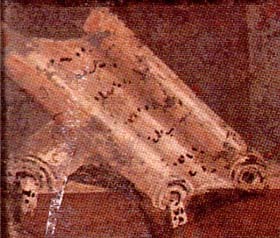 But the title of the work in each roll was written on a parchment slip known as the sillybos, or sometimes sittybos – the literature doesn’t indicate which is correct – which protruded from the end, allowing the reader to find out which roll he needed without unrolling any of them. Postea vero quam Tyrannio mihi libros disposuit, mens addita videtur meis aedibus. Qua quidem in re mirifica opera Dionysi et Menophili tui fuit. Nihil venustius quam illa tua pegmata, postquam mi sillybis libros iIlustrarunt. Vale. Et scribas ad me velim de gladiatoribus, sed ita, bene si rem gerunt; non quaero, male si se gessere. Since Tyrannio has arranged my books, the house seems to have acquired a soul: and your Dionysius and Menophilus were of extraordinary service. Nothing could be more charming than those bookcases of yours now that the books are adorned with title-slips. Farewell. Please let me know about the gladiators: but only if they are behaving well; if not, I don’t want to know. Domum meam quod crebro invisis est mihi valde gratum. Viaticum Crassipes praeripit. Tu “de via recta in hortos.” Videtur commodius ad te: postridie scilicet; quid enim tua? Sed viderimus. Bibliothecam mihi tui pinxerunt constructione et sillybis. Eos velim laudes. I am very grateful to you for going to see my house so often. Crassipes is swallowing all my travelling money. You say I must go straight to your country house. It seems to me more convenient to go to your town house, and on the next day. It can’t make any difference to you. But we shall see. Your men have beautified my library by binding the books and affixing title-slips. Please thank them. The slip has on it the name of “Bacchylides” – a poet of the 5th c. BC – with the title of the work, the Dithyramboi, underneath. The bit of text attached is from the 17th dithyramb. 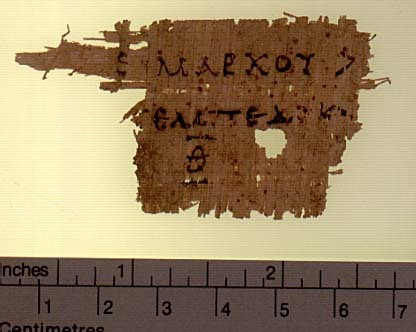 The manuscript is BL papyrus 2056 (= P.Oxy. 1091), and is 2nd century AD in date. 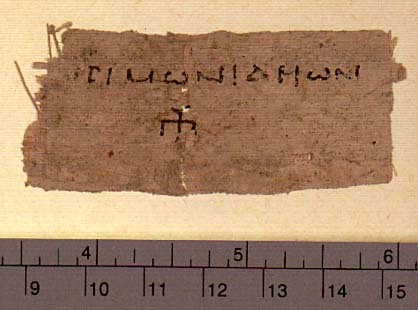 It is, of course, from Oxyrhynchus, as is papyrus 733, the unique manuscript of Bacchylides’ poems. It’s wonderful to see something like this. It’s obvious how these could become detached, and a work could become anonymous and untitled. 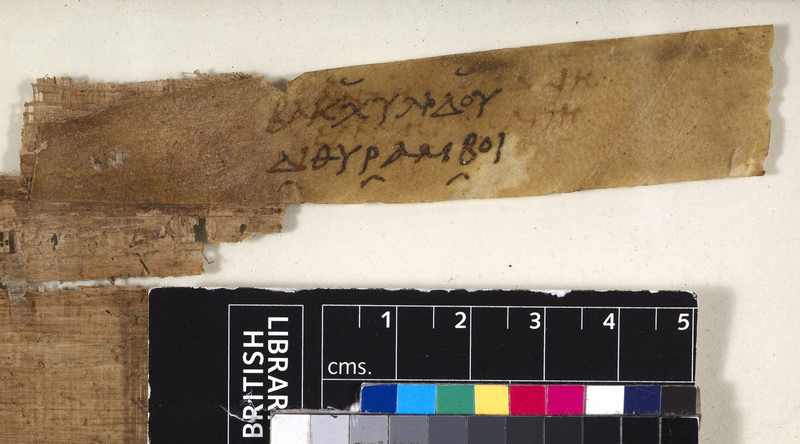 Another sillybos of the 1-2nd century is preserved from a copy of the 9th book of Hermarchus against Empedocles, POxy vol. 47, 3318. Note that a number of other sillyboi may be seen at the Oxyrhynchus website here. 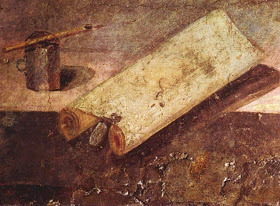 I was also able to find another ancient depiction of a sillybos, protruding from a roll in the paintings from Pompei. I found this online here. Updated 21/07/2018 with additional images.